LA QUINTA, Calif. -- When packing your bag for the Dunes Course at La Quinta Resort & Club, ensure you've got all 14 clubs -- you'll need each of them. Expect to use the full complement of short irons on the Dunes Course at Quinta Resort & Club. There's not one, but two Pete Dye courses tied to the famed La Quinta Resort & Spa in La Quinta. The Dunes Course is Dye's version of a relaxing round. Like its Mountain Course sibling, the Dunes wasn't designed for distance; though bombers will no doubt be well served by playing the TPC Stadium Course (7,300 yards), the Jack Nicklaus Tournament Course (7,204) or the Greg Norman Course (7,156) upon La Quinta's partnered tracks at PGA West. Instead, Pete Dye's Dunes design is expertly crafted for the intermediate player who wants to (or should) be playing from the whites at 6,324. Though the landing areas are mainly generous, the Dunes isn't a pushover, by any means. While the course may tender a mere three 400-plus-yard par 4s from the tips, the Dunes offers the stout defense of a readily challenging collection of par 3s combined with a testy host of elevated greens. "If you fade the ball, you can shoot a score here," says La Quinta Director of Golf Bill Shaw. "Anytime you're getting to raised green, the fade lands softer. Most golfers fade or slice; if you set up properly, the Dunes is set up for that." The consistent tee player -- long or short -- will derive ongoing opportunity from the round, as approaches present the test of using the full complement of short irons. Accuracy with the 7-through-wedges is a must to score. "When you have those greens that are raised, they have to receive the golf ball," Shaw says of the Dunes' design and maintenance. "Otherwise, you're not being fair to the golfer -- he's doing what was asked of him. He's hitting the ball to the green." The Dunes' crew maintains the integrity of Dye's design by keeping the greens tightly cut, and the putting surfaces are well-known in the area to be consistently glassy but fair. Be certain to review pin placements here, as playing above the hole can quickly escalate cozy pars into debacle doubles. "On holes 2-6, you have what we call 'The Gauntlet,'" Shaw explains. "It's such a great challenge; you're in a lower area, and you've got to be really focused. "And when you get to No. 7, it turns right to the mountains. You get the vistas and Dye opens up the course a little bit but keeps it challenging with the terrain." The Dunes thrives in full on No. 11-No. 14, when the track winds toward the Santa Rosa Mountains. The 349-yard par 4 at No. 12 is a peach, sporting water along the left of the fairway and a sneaky drink along the right side of the green. A placid but penal lake guards the exceptional 13th, a slight 145-yard par 3 that demands your attention to clubbing usurps the beauty of the hole. 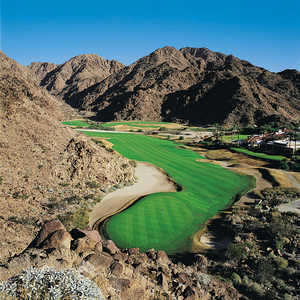 "The Dunes is great; maybe among the top 10 in the Valley," says Bernard Flores, a high handicapper from Palm Springs. "It's like a private course. I think the back nine is really nice with the water features." Water reappears with aplomb on the signature, 420-yard par 4 at No. 17. The Dunes' top handicap and longest par 4 features water along the entire left side of the fairway. This isn't simply the toughest tee shot on these grounds; it's among the most challenging in the Coachella Valley. "On No. 17 you're just trying to cut off as much as you can," Shaw said with pride. "But you've gotta be careful because you can't go right with bunkers and the natural area." La Quinta Resort & Club and PGA West are home to the Jim McLean Golf Schools, offering myriad instructors for both beginning and advanced lessons. New, state-of-the-art, touch-screen GPS systems just arrived this summer at all La Quinta and PGA West courses, and the Dunes and Mountain present a full practice facility with driving range, short-game area and putting green. Jar the adrenaline and be ready to hit some golf shots. For short hitters, La Quinta's Dunes Course is ideally played from the forward tees, where the hybrids can find a respite and that rusted 8-iron comes back into play. Deftly navigating the tightly mowed collection areas and fast greens account for scoring here, and the refined short game will undoubtedly out-duel blind muscle every time.